Snorkeling Florida is an experience not to be missed if you are lucky enough to be visiting any of Florida’s spectacular beaches. Snorkeling has been the root of many wonderful memories for our family. Some Florida beaches are better than others but don't wait for the perfect situation before you don the mask and flippers and jump in. There are some things you should consider before leaving home if snorkeling Florida is high on your list of 'fun things to do on vacation'. To make the most of your snorkeling vacation, plan your trip around the three C's of snorkeling. Collections (colorful fishes, coral, sea grasses, rocks, and, of course,shipwrecks. For calm and clear, the Gulf Coast has less wind and less wave action so this is a great place to learn to snorkel and certainly less frightening for young children. Beautiful underwater landscapes await you. The Atlantic Coast has some beautiful calm and clear water but on either side, the water can turn cloudy very quickly. Some days you can see for miles and the next, you can't believe it is the same beach. The best collections of colorful fishes are around coral reefs, shipwrecks and places where wood and metal structures were dumped in the ocean a long time ago (when it was allowed). For you serious snorkelers who want calm, clear and fabulous underwater collections, head right on down to the Florida Keys. The best places to snorkel or dive are a short distance from the beach but you will have to take a charter boat to get there. You will not be disappointed and will feel it worth the fee. Your captain knows exactly where to take you to see gorgeous underwater landscapes. The best collections of colorful fishes are around coral reefs, shipwrecks and places where wood and metal structures were dumped in the ocean a long time ago (when it was allowed). You will be thrilled by schools of neon brightly colorful fishes that you have only seen before in salt water aquariums behind thick glass. 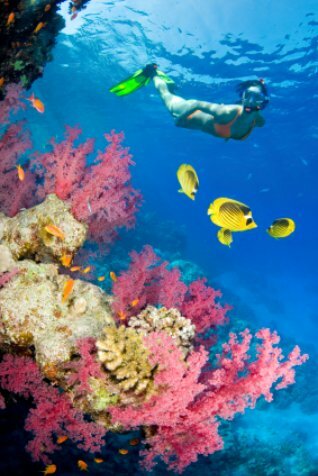 Most beaches have snorkeling lessons, tours and excursions and it doesn’t really matter if you're a pro or a novice, it’s fairly easy and is a great activity to add to any vacation itinerary. Don’t forget your underwater camera because you’re going to see a lot of amazing coral reefs and underwater creatures! Before you embark on your snorkeling Florida adventure, there are a few things to keep in mind. If you’re planning a deep-sea snorkeling adventure, you’ll be using a snorkeling mask and snorkel, swim fins and most likely wearing a wetsuit. If you think you might be going snorkeling a lot, it might benefit you to buy your own equipment. Most swim shops in Florida sell snorkeling gear and you can get everything for under $100. If you don’t mind using the equipment that group tour boats and swim shops provide, then you don’t need to purchase your own but sometimes it’s a good idea to invest in at least a snorkel and goggles of your own so that you don’t have to put your mouth where many others have before. We’re not saying that the equipment isn’t cleaned after every use, but you might still prefer to buy your own set. You can get a good snorkel and goggles for around $30 but there are cheaper ones available as well. Once you’ve decided to either use the equipment provided on the boats or to bring your own, you’re on your way! Snorkeling Florida will treat you to an underwater adventure you will never forget! You should pick a beach that is known for it’s underwater artwork like Key Colony or Crescent Beach, which both have some great coral reefs for divers and snorkelers to explore. Then, find a tour boat or surf shop that you feel comfortable with and go for it! If you’re a first-timer, you will get a short introduction to snorkeling and be taught how to properly wear your mask/ goggles and use your snorkel. Basically, you’re just going to use the snorkel to breathe when above the water and it also helps you take in more air when you’re ready to dive down way below the surface to see something up close and personal. Your swim fins will help you gain momentum in the water and swim faster. If you’re snorkeling in deeper depths, your wetsuit will keep you warm and protect you. One thing that happens if you venture more than a few feet below the surface of the water is pressure on your ears. Make sure that you equalize the pressure if you feel it by holding your nose and blowing gently. Some people use this trick to adjust to the altitude when aboard airplanes and it works the other way around too. If your ears do start to hurt at any point, return to the surface and try again. When snorkeling Florida, you need to keep your eyes open to a few of the ocean’s creatures that could harm you. Then tend to stay away from large groups but if you’re on your own or in a smaller group, swim slowly back to your boat or to shore if you see any eels or sharks. Don't splash any more than necessary or call attention to yourself. Don’t panic, they’re most likely going to leave you alone anyway, but just try to steer clear. Another creature you should look out for is the sea urchin. Sea urchins are small, black sphere-shaped creatures that feed on algae, so you may find them around corals and rock formations underwater. Their spikes are razor sharp and if you graze one, you could get cut. Just avoid them as much as possible and you should be fine. You don’t really want to touch anything you find as you’re exploring underwater anyway, as tempting as it may be. It’s a “look but don’t touch” kind of activity because you never know what you’re looking at… you don’t need to touch it to appreciate its beauty. If it’s your first time snorkeling, you’ll probably find that it’s an exciting and fun activity and you’ll want to do it again and again. Luckily, Florida’s beaches provide many incredible coastal habitats for you to explore! Read through all the beaches (they are long but painless, I promise) in the seven different regions we have explored and you will be excited by some of the opportunities for snorkeling in Florida. Also, we would love to post some of your underwater pictures the next time you snorkel Florida so send them on. If we left anything out of our info on Snorkeling Florida, please let us know. One of the best snorkeling places in Florida is John Pennekamp Coral Reef State Park.